What is the function of endocrine glands? Endocrine glands produce specialized chemicals called "hormones". These regulate and integrate many activities to maintain internal stability of the body. The hormones pass directly into the blood to affect target cells elsewhere. The endocrine system includes the adrenal glands, thyroid gland, parathyroid gland, pituitary gland and specialized cells in the pancreas called the Islets of Langerhans. Some cells in other tissues throughout the body also produce certain hormones. The pituitary gland at the base of the brain links to the other endocrine glands and regulates hormone production by the adrenals, thyroid and sexual organs as well as growth and the body's day-to-day cycles of activity (diurnal rhythm). The adrenal glands are a pair of distinct glands located close to the kidneys. Each adrenal gland has two parts. A hormone produced in the pituitary gland (called adrenocorticotrophic hormone, ACTH) controls the outer part, called the adrenal cortex. The adrenal cortex produces steroid hormones of several types. The inner part, or adrenal medulla, originates from the same cells that develop into the nervous system in the embryo. Therefore, it is not surprising that it produces neuroendocrine hormones with effects similar to those of the sympathetic nervous system. What tumors occur in the adrenal medulla? Tumors of the medulla of the adrenal glands may be hyperplasia (non-cancerous cell overgrowths) or cancerous. Adrenal medullary tumors are rare but pheochromocytomas are the most common type and usually occur in middle aged to older dogs. 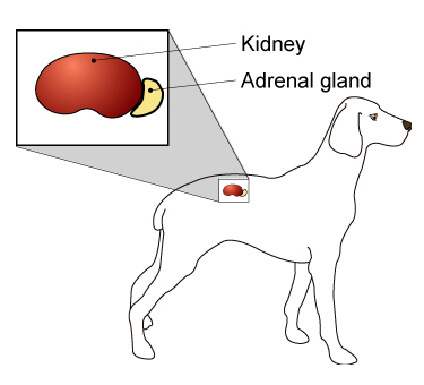 Tumors of the nerve cells of the medulla are rare but benign adrenal ganglioneuromas occur in older animals and malignant adrenal neuroblastomas can develop in young animals. "Approximately half spread to other parts of the body (metastasize)." Few are diagnosed until late in the course of the disease because, unlike tumors of the adrenal cortex, medullary tumors do not produce clinical signs. Approximately half spread to other parts of the body (metastasize). We know little about the cause of tumors of the adrenal medulla. Some animals have a greater tendency (genetic susceptibility) to cancer. Some breeds have far more cancers than others, often of specific types. Adrenal medullary pheochromocytomas are most common in Boxer dogs. How will these cancers affect my pet? Small medullary pheochromocytomas usually have no clinical effect, but approximately half are larger and invade the main vein (vena cava) returning to the heart. This impairs blood return from the hind legs. At least a quarter of the tumors spread to other organs, including the adjacent bones of the spine. The tumors are occasionally functional and induce high blood pressure, increased heart rate and enlargement of the heart. Medullary ganglioneuromas are usually benign but the neuroblastomas that develop in young animals may spread throughout the body cavity. Cancer is often suspected from clinical signs. 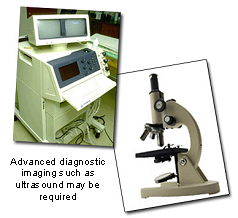 X-rays, ultrasound and MRI (magnetic resonance imaging) or CT (computerized tomography) scans may be useful in detecting the tumors, including metastases. To identify the tumor type precisely, it is necessary to examine the tumor itself. This involves exploratory surgery, often with total removal of the tumor. After removal, the tissue samples are submitted for microscopic examination by histopathology. Specially prepared and stained tissue sections are made at a specialized laboratory where the slides will be examined by a veterinary pathologist. The histopathology report typically includes words that indicate whether a tumor is 'benign' (non-spreading, local growth) or 'malignant' (capable of spreading to other body sites). These, together with the origin or type of tumor, the grade (degree of resemblance to normal cells or 'differentiation') and stage (how large it is and extent of spread) indicate how the cancer is likely to behave. The veterinary pathologist usually adds a prognosis (what will probably happen). This may include information on local recurrence or metastasis (distant spread). Treatment for adrenal medullary tumors is surgical removal of the tumor. Can these cancers disappear without treatment? It is not common, but the loss of blood supply to a cancer can make the cells die. Unfortunately, the disappearance of the cancer is rarely complete. After any surgery, you need to prevent your pet from interfering with the operation site and to keep it clean. 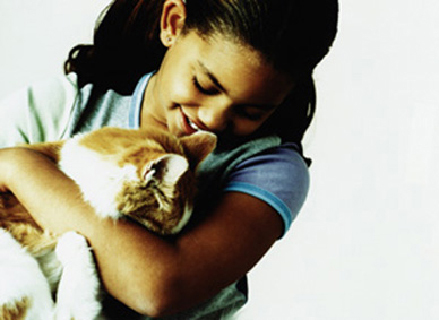 Any loss of stitches or significant swelling or bleeding should be reported to your veterinarian. You may be asked to check that your pet can pass urine and feces or to give treatment to aid this. If you require additional advice on post-surgical care, please ask. How will I know how the cancer will behave? Histopathology will give your veterinarian the diagnosis that also helps to indicate how a tumor is likely to behave. The veterinary pathologist usually adds a prognosis that describes the probability of local recurrence or metastasis (distant spread) for cancers. "The diagnosis also helps to indicate how a tumor is likely to behave." Based on the specific diagnostic information that has been obtained for your pet, your veterinarian may be able to predict how the specific tumor in your animal is likely to respond to treatment and behave in the future. 'Cured' has to be a guarded term in dealing with any cancer. Unfortunately, most adrenal medulla tumors are large by the time they are diagnosed because few of them produce hormones and so there are no early clinical signs. Approximately half of these tumors will spread to distant organs (metastasize).